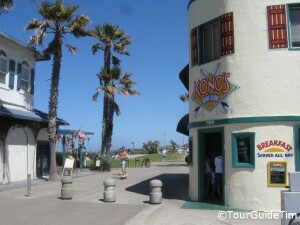 Pacific Beach Activities & Nightlife - TourGuideTim Reveals San Diego! 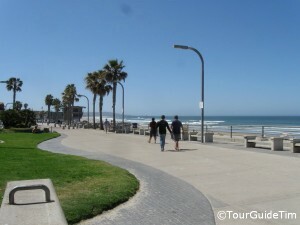 Pacific Beach Highlights: The three-mile stretch of wide sandy beaches from Pacific Beach in the north to South Mission Beach is the most popular beach area in San Diego. Pacific Beach is usually referred to as PB. Both the Mission Beach and Pacific Beach communities consist of vacation rentals, college students, and the young-at-heart who enjoy the active lifestyle opportunities provided by the beaches and adjacent Mission Bay Park. 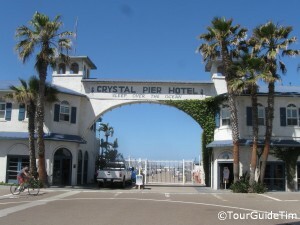 The young crowds are particularly attracted to Pacific Beach because they can enjoy food and drink at over 150 restaurants and bars. Beach Activities – The beach area is a place to see and be seen. Many will be working on their sun tans while others will be tossing around frisbees or bouncing a ball between beach paddles. There are designated areas for surfing. 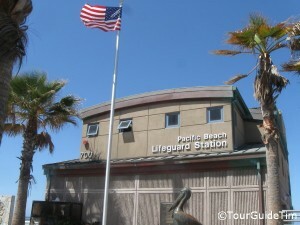 A lifeguard station at the end of Grand Avenue and another one farther north are manned year-round. Other lifeguard stations are only open during the summer months. Showers and restroom facilities are only available at the end of Grand Avenue and near the end of Pacific Beach Drive. To watch all of the activity, there is a narrow boardwalk extending the entire length of the beach area. Along the boardwalk, visitors will find a small handful of bars, restaurants, and shops. The boardwalk from Pacific Beach south to Belmont Park is the most crowded. Visitors navigating the narrow boardwalk will have to watch out for a combination of joggers, cyclists, and in-line skaters. Concrete fire pits are available in various locations for visitors to create an evening bonfire. You must bring your own wood or charcoal. Visit the City of San Diego web site page for Pacific Beach and North Pacific Beach for more details. Beach Rentals – You can rent beach chairs and umbrellas as well as bikes, in-line skates, and surf boards in advance from Cheap Rentals. You should also be able to find other rental shops along the beach near the ends of Garnet and Grand Avenues. Beach Weather – Visitors can enjoy the beaches in San Diego year-round. However, finding ideal beach weather during the winter and spring is hit or miss. The best beach weather occurs from July to October. Ocean water temperatures are usually around 70 degrees during the summer and 60 degrees during the winter. Learn more about San Diego weather. Restaurants & Bars – PB offers over 150 restaurants, bars, and shops. Most are found all along Garnett Avenue, with an additional high concentration of options on Grand Avenue near the beach and along Mission Boulevard. Most provide a laid back atmosphere and many are geared towards college students and singles. However, there are a small handful of fine dining restaurants and upscale bars scattered throughout the area. The local Union Tribune Newspaper has put together the best list of bars in Pacific Beach with brief descriptions. Since there are so many restaurants in the PB area, Yelp.com provides the best way to find restaurants in Pacific Beach. 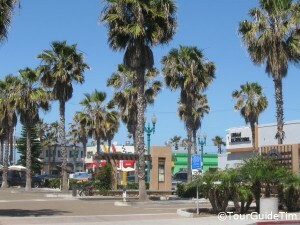 Parking – Free street parking is the primary parking option in Pacific Beach. Keep an eye out for a handful of spots that have time limits. Most visitors will look for parking on side streets near Grand and Garnet Avenues. The closer you get to the beach, the harder it will be to find a spot. There are a few unmanned pay lots that charge $5 – $10. Related Attractions – For those looking for a quieter beach outing, head a mile south to the bay side of Mission Bay Park where the crowds are much smaller, the beaches are fairly empty, and the water is much calmer. Mission Bay Park also offers a number of water sports and boating.